THREE Zlichovaspis and Cheirurus on One Rock! Size: Plate is 7" long, largest trilobite is 3.8"
This is a RARE multiple plate of Devonian trilobites. There are TWO wonderful Zlichovaspis rugosa and a complete Cheirurus (Crotalocephalina) gibbus on the slab. This amazing fossil was expertly prepared under a microscope in the EXTINCTIONS Prep Lab here in Colorado. There are TWO excellent Zlichovaspis rugosa on the plate. Both specimens are complete and display well. There is also a fine Cheirurus (Crotalocephalina) gibbus preserved in the middle of the other two bugs. 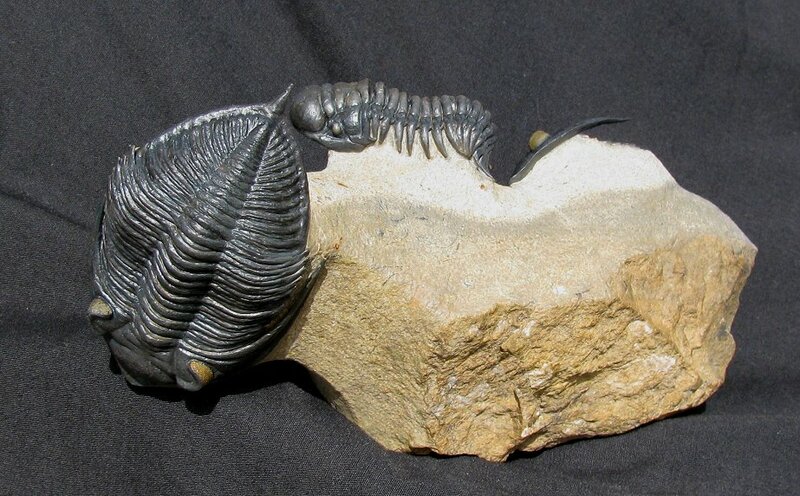 This trilobite is nicely outstretched with the tail curled and very well articulated. All three bugs have great detail and display beautifully. And this is a natural triple - all three specimens are preserved as they were when they were buried millions of years ago. This is a very unique and collectible multiple plate of two different types of Devonian trilobites.